If you are looking for Guitar Lessons in Dublin…You probably feel a bit frustrated by not knowing where to start, or maybe you tried to teach yourself guitar, you got some practice in, but still, there is little or no progress. Maybe you’re playing already, but you don’t feel motivated to move on, by lack of direction or structure in your practice.Or maybe you’re all of this combined! I know how you feel, my name is Patrice, me and my team of 2 other teachers are offering guitar lessons in Dublin City Centre for now more than 10 years . We have experienced the same kind of challenges as guitar players, and in the school, we have people coming to us on a regular basis to fix the same issues. A plan of action to get the ball rolling! 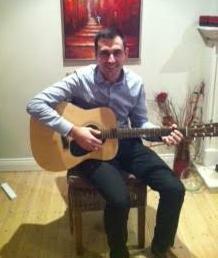 A lot of guitar teachers in Dublin will ask you what you want to play, winging the lessons from week to week. While this method can work for some time, and (maybe) for some students, it can hurt you badly in many ways. How can you make steady progress, if you don’t set up goals, deadlines to achieve them, and have a clear map to follow? We WILL have a plan of action for you, something proven that has been tested and re-tested over the years and make guitar players the way they want to be. On the free lesson we’re going to sit down, evaluate your playing, or your abilities if you’re a beginner, and we’ll set up a strategy that WORKS. Imagine if you could know exactly what to practice from week to week, with a complete follow-up system that will make you learn quicker and faster. Every lesson is followed by detailed practice plans and guidelines on objectives to achieve, short and long term. #3. Support and feedback on your playing. What if you could get constant feedback and support on your playing, our students have access to a library of professional video/audio tutorials that we’ve made ourselves, to illustrate ALL of your lessons with us, which comes quite handy for your practice, it’s like having the teacher at home, everyday! We have also regular recording sessions to help student evaluate their playing. #4. Guitar lessons with extra added value. We have systems in place to organize musical events on a regular basis. We consider them as important as the guitar instruction itself. To play the guitar you need more than just ‘normal guitar lessons’, imagine if you could JAM with other like-minded guitarists and other musicians, boost your confidence playing in public, we can get you free access to monthly band workshops, and an opportunity THREE times a year to perform in public. Avail of you FREE introductory lesson with a complete evaluation of your playing/abilities. Successfully learn to play the guitar in the most effective manner, with a proven strategy. Improve your skills and finally play the way YOU want. 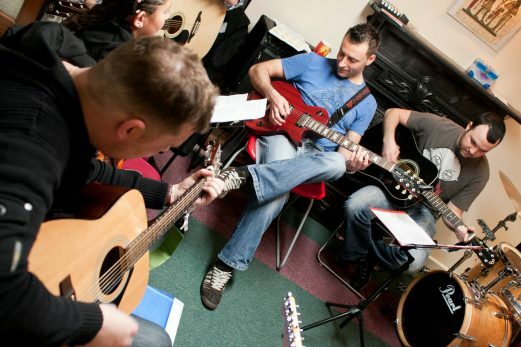 Benefit from the most dedicated guitar teachers in Dublin. Copyright © 2019 Patrice Revel Guitar School. All rights reserved.